Can They be Made Kosher? The answer to the question is definitely yes. But the real question is whether it is advisable to process the hindquarters of an animal as (glatt) kosher in the way that we butcher meat in the US. And the answer to that is different according to whom you ask. Currently, there are only a few meat companies selling these products and their price is often around $60 per pound (before cooking). But the price is not the main issue. The potential problems that may result is what we should really be addressing. That is why we, who grew up in the US, always assumed that those cuts of meat were non-kosher, and they were only able to be sold by non-kosher butchers. What are the potential issues that present themselves with making hindquarters kosher? Almost all of the forbidden fats in an animal (chelev), called tallow and suet in English, are in the hindquarter. Also, the gid hanashe, the sciatic nerve, is located in the hindquarter. Removing these two prohibited parts of the animal is called deveining (treiboring), activities that demand a high degree of training and supervision. Anyone familiar with the size of today’s meat production plants realizes that each step requires oversight. The cost of trained personnel (often non-Jewish) and additional supervision far outweigh the lost income from selling the hindquarters to non-kosher plants versus selling a kosher product to the Jewish market. Until 2011 that is the way it was. We eat the forequarters of kosher slaughtered beef and the slaughterhouse sells the hindquarters to the non-kosher market. Now, a handful of meat producers, on both the east coast and the west coast, are introducing sirloin steaks and filet mignon for their customers. The kashrus establishment is not attaching their names to these products. Instead, these operations, one tiny and one quite sizable, are using rabbis who are little known in the broad Jewish community. One of the rabbis is actually self-certifying his own products. He himself deveins kosher slaughtered hindquarters, sells the meat, and certifies his products as glatt kosher. 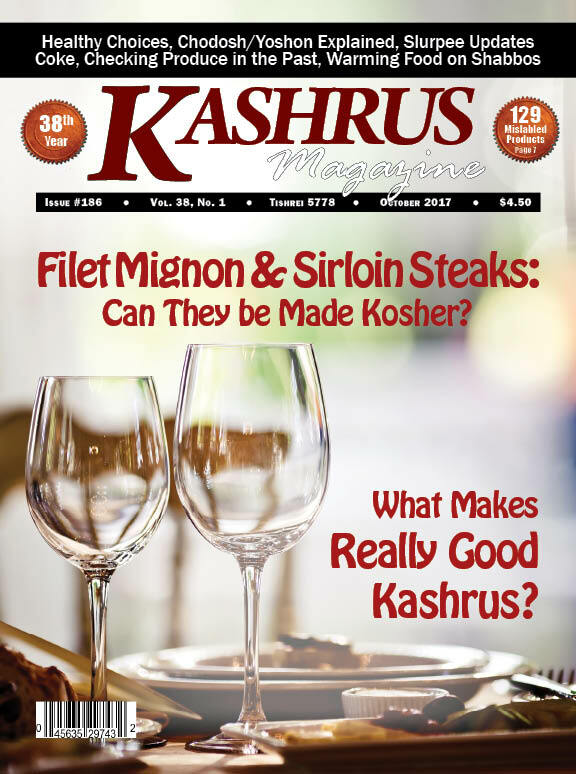 How does the kosher establishment explain why they do not certify the hindquarters? There are basically 5 reasons. 1. The punishment for eating forbidden fats is kares, literally “cutting off” one’s soul, the severest and most dreaded punishment for the believing Jew because it means the loss of everlasting life (Vayikra 7:25). That means that eating chelev is much more serious than eating pork. 2. Chelev is not a separate part of the animal; it is attached to and even enters into the meat, demanding great training and devotion to remove it. 3. Deveining the gid hanashe from the hindquarter is a specialty. It is slow and cumbersome. If not done correctly, the consumer will be eating the prohibited sinew. Correctly removing the gid hanashe makes it difficult to keep the meat looking attractive. 4. Historically, rabbis in the USA and Europe either banned this deveining or withdrew their support for it over repeated problems discovered in the implementation of the deveining. 5. The cost factor makes it better to sell the hindquarter to the non-kosher market. It was a great selling point, one that made the Rubashkin company one of the most well-known across all 50 states. Please note that in the 1990’s, the “OU” began certifying glatt kosher venison including the hindquarters. This was due to the fact that venison (deer) is not an animal (behema) [read that domesticated animal], but rather a wild animal (chaya), which does not have any chelev. The only issue was the deveining of the gid hanashe. Rabbi Yisroel Belsky, zt”l, a posek for the “OU” and an expert at deveining, helped to train the “OU” staff on removing the gid hanashe. He also made many public demonstrations on the removal of the gid hanashe. The number of obese children in the United States is growing by an alarming rate, with obesity now affecting one in every six children, according to the CDC (Centers for Disease Control and Prevention). As parents, we are responsible for how our young children eat. If a person fills their home with sugary snacks and drinks, their children are going to get used to them. It doesn't take a rocket scientist to see that unhealthy choices may cause a large array of food-related diseases, such as diabetes and high cholesterol. But, if your fridge is stocked only with good, clean foods, your children won’t become addicted to the sugary snacks and will make good food choices throughout their lives. It’s not just about disease prevention because, by eating healthy, you may actually live a longer, more youthful and vibrant life. As parents, we are capable of programming our families taste buds, because we do the shopping. We can stock up on high-priced snacks that are addictive in nature, or we can choose not to do so. It’s in our hands. Habits start very early, both good ones and bad ones. We can train our children to practice restraint and not to have a problem making healthy choices. Another benefit is that when young people grow up with an understanding of moderation, they may be better prepared to handle other issues that come their way. Parents who give their children candy in moderation and aren’t afraid to say “no,” teach their children not to become dependent on quick fixes in their lives. For those not taught moderation, snacking may well become an addiction. 1. Fill your home with healthy foods. Trust yourself. You already know what is and what is not healthy. Go through your kitchen and get rid of what isn’t healthy — the chips, pretzels, or other processed “junk food.” If you can, stock up on tasty fruits and vegetables; organic is best. That way, you’ll know that the food you are buying is free of pesticides, artificial preservatives, and additives. Get your kids to enjoy some healthy root vegetables, delicious smoothies, and fresh nutritious fruits. Another great option — buy a dehydrator. Dehydrated vegetables taste delicious and your kids will love them. 2. Be prepared for some backlash from your children at the beginning. Your children might be embarrassed to eat an almond date ball cocktail for a snack, while their friends are eating chocolate pudding. You don’t want your children to go to school and feel left out, but it is worth it for them in the long run. Kids may make fun of their healthy snacks at first, but, at the end of the day, the ones who become dependent on sugary snacks will wish that they had developed healthier eating habits when they were young. 3. Rethink the way you entertain. I let guests choose how they want to eat, but I always tell them that eating healthy makes me feel good and I encourage them to try it. They may thank me later, if they go with my suggestion. I think we can all agree that we want our children to live long, happy lives. But it is up to us to create an environment that encourages our kids to make smart choices and develop healthy eating habits. It’s not too late to start now. With the help and guidance of Hashem we should all be blessed with long life, happiness, and peace of mind.